YOUR New Journey - ONLINE! Join us on a journey for the new foundations of your innovative enlightened life... Right from the place in the world where you are! Includes 2 hours of live streaming each morning. As an extra bonus, on each day we will interact and share live videos on a private Facebook group. Video replays also available! 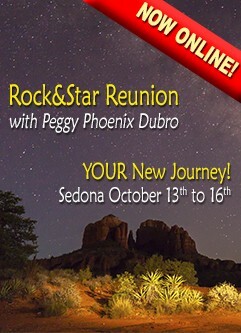 I have received emails from so many of you around the world who really want to be here in Sedona, but due to exceptional circumstances in your lives you are not able to travel at this time. GREAT NEWS: Through the modern magic of live streaming on the internet, you are now able to attend this unique gathering from wherever you are located. Video replay is also available. For two hours each morning of the R&S Reunion, we will be together. You will be able to download and print a very special Journal titled "My New Journey! Living Energetically Aware". With the assistance of our remarkable team of Journey Guides, we will co-create a unique Reunion featuring your own special talents, skills, and abilities. When we finish the four days, your Journal will be filled with your sacred, precious, and personal experiences - the beginning of your new book of living life energetically aware. As an extra bonus, on each day we will interact and share live videos on a private Facebook group. You are born of the earth and of the stars, YOU are a Rock&Star, this IS your reunion! New Phoenix Alignments are developing now in the transformational energy preceding this event! You will bring life to your journal and this journal to your life through these new Alignments. Are you ready to fully empower and live your transformational life? In the physical dimension, we will strengthen the co-creation of new habits of caring for yourself in the new energy. In the mental dimension, we will honor the support and flexibility of our mind and our neurons. In the emotional dimension, we will continue to activate the intelligence of the heart, mastering our energy in motion (e-motion) and activating the new bandwidth of emotions that is available for us now. In the spiritual dimension, we will align with a new expression of ourselves as Universal Pioneers. Our experience together will include sounds, music, toning, drumming, the practice of silence, energy postures, special guests and more! I have been inspired to request assistance from five members of our amazing Community. These Rock&Star Journal Guides will help us in our journal writing as we explore and empower the new ways we choose to live now. Local area astrologer Rosemarie Brown will guide us through the tidal charts of celestial energies during our time together, with the intention that you may wisely ride and record your experience of the energy waves of this profound gathering!